Lots of Chips to Cash Out! You've all heard by now that an ex-dealer at the Wynn Macau who says he's been a heavy gambler since puberty is responsible for the disappearance of more than $6 million of the casinos chips. But in spite of his confession, he supposedly is refusing to tell authorities where the stolen chips are or if some of them may have already been cashed out. To me, that's the confusing issue: cashed out. Like in most Vegas casinos, chips obtained at the Wynn Macau can only be cashed out at the Wynn Macau. It is not like the old days in Vegas where you could cash out one casino's chips inside another casino, which was a great help for casino-cheat team looking to get rid of "hot" chips just used in a cheat move. Unless there was a city-wide casino-cage alert for one particular casino's chips, cheats and hustlers generally had no problem cashing out one casino's chips at another casino's cage. But the free-cash-out privilege has long disappeared in Vegas and, as far as I know, never had validity in Macau. So, that brings me to the question. I have read accounts that the dealer and his cohorts, if there are any, may have "fenced" the $6 million lot of chips to an underground Macau banking system controlled by the Chinese Mafia, known as the Triad, but for just a piece on the Hong Kong dollar. I have also read that the only way to get rid of the chips and then turn them into cash is to cash them out at the Wynn Macau in small amounts so as not to pick up heat. Which begs to ask: Did the dealer steal $6 million in chips of small denominations? If he did so he would have needed quite the large wheelbarrow to wheel them out of the casino. But if he stole the $6 million in high denomination chips, such as $500 and above, then I would think the casino can simply remove all their high denomination chips from circulation and replace them with another set. Doing so would make it impossible to cash out the stolen high-denomination chips and render them essentially worthless. Unless of course the dealer removed the chips from the VIP room where there seems to be an inventory and accounting system much unlike that of the central casino cages. I have heard that the chips trafficked inside Macau VIP rooms are not easily tracked. All major casinos across the world have sets of back-up chips that can be put into circulation at any time. 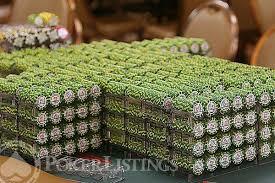 So I am wondering which denomination chips make up the missing Wynn Macau six-million. If anyone out there can enlighten me, please do and I will pass along the information.